We were honored by the news that the Leica Store DC chose our image from a recent trip to Botswana for display on their Oskar Barnack Wall during the month of October. Oskar Barnack was the developer of the ur-Leica, which means he was the person who invented 35mm photography. To be associated in any way with his name is an honor, and we appreciate the Leica Store for choosing our image. For those lucky enough to live in the Nation’s Capital, the Leica Store has, since May of 2012, become a remarkable hub for photography here. Whether or not one shoots Leica, to have a serious photography store host so many events, and to be so welcoming, seven days a week, to street shooters wandering by, is pretty remarkable. We’re fortunate to have them in the community. The camera equipment’s not bad either. About the image: this was taken on the first night of our trip to the Okavango Delta, at Tubu Tree. Literally an hour after our arrival, we went out in the Land Rover and our guide led us to this. Leica M, 90mm APO-Summicron-Asph. 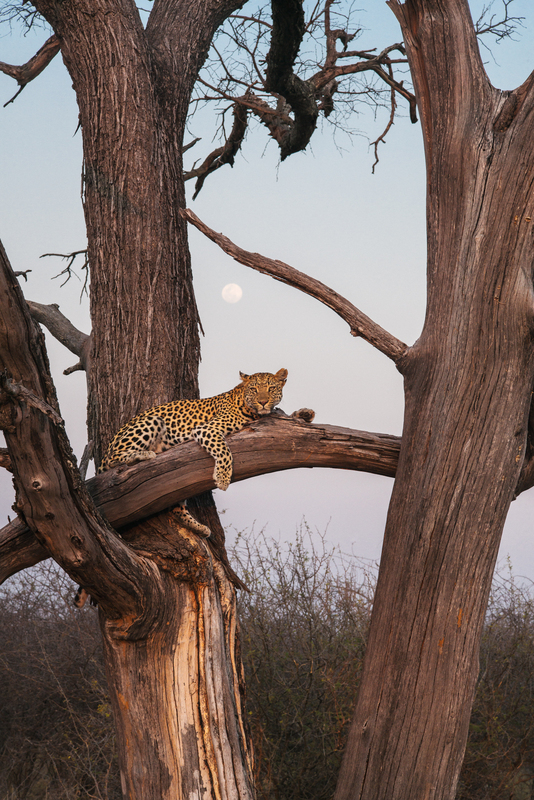 That the moon was rising and framed by tree branches while the leopard stared at us was just the kismet of the cosmos. This image, and a set of 12 black and white images from the same trip, are for sale at The Stephen Bartels Gallery. This entry was posted on October 4, 2014 at 1:36 pm and is filed under Uncategorized with tags Botswana, Leica M, Leica Store DC, Stephen Bartels Gallery, Summicron 90mm. You can follow any responses to this entry through the RSS 2.0 feed. You can leave a response, or trackback from your own site.